(Nanowerk News) Diamonds are renowned for their seemingly flawless physical beauty and their interplay with light.Now researchers are taking advantage of the mineral's imperfections to control that light at the atomic scale, generating one photon at a time. A team of engineers and applied physicists from Harvard University, the Technical University of Munich and Texas A&M has sculpted a novel nanowire from diamond crystal and shown that the wire can act as a source of single photons. 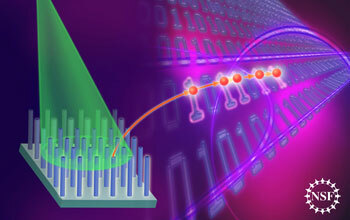 The team reported its findings online Feb. 14 in the journal Nature Nanotechnology. To create their diamond nanowire device, the researchers took advantage of the same physical processes that give some colored diamonds their hues. For example, when a diamond appears blue or yellow, the pure carbon of the diamond crystal has been sullied by scattered impurities that were incorporated into the carbon while the diamond was forming. Atoms of boron result in a blue diamond; atoms of nitrogen yield a yellow diamond. The interloping atoms are trapped within their solid-state host, causing the perfect diamond latticework to bend to accommodate the imperfections and ultimately changing the electronic states in the atoms. In jewelry, the result is stunning color. In the nanowires, the result is a device that can generate a high flux of individual photons. "The diamond nanowire device acts as a nanoscale antenna that funnels the emission of single photons from the embedded color center into a microscope lens," said lead researcher Marko Loncar of the School for Engineering and Applied Sciences (SEAS) at Harvard. For the device, the researchers focused on diamond engineered with Nitrogen-Vacancy (NV) centers, where nitrogen atoms are adjacent to vacancies in the surrounding diamond crystal lattice. Researchers have known about NV centers for some time, and have demonstrated their utility for quantum communications, quantum computing, and nanoscale magnetic-field sensing. But until now, researchers had not engineered the diamond host, yielding a complete device that can be integrated into existing technologies. "Using a standard manufacturing process, the team has achieved the unique combination of a nanostructure with an embedded defect, all within a commercially available crystal," said Dominique Dagenais, an expert in NSF's Division of Electrical, Communications and Cyber Systems who is familiar with the team's work. "The resulting device may prove easy to couple into a standard optical fiber, Dagenais added. "This novel approach is a key technological step towards achieving fast, secure computing and communication." The current product is an array with thousands of diamond nanowires--each only a few millionths of a meter tall and 200 billionths of a meter in diameter--sitting on top of the macroscopic diamond crystal from which they came. Because the NV centers are not uniformly distributed in the original diamond crystal, each wire has its imperfection in a different location, resulting in varied coupling between the NV centers and the diamond nanowire antennas. In the future, a technique called ion implantation could be used to generate the defect centers at predetermined locations, optimizing the devices. "This exciting result is the first time the tools of nanofabrication have been applied to diamond crystals in order to control the optical properties of a single defect," said Loncar. "We hope that the greater diamond community will be able to leverage the excellent performance of this single photon source." Loncar's co-authors included graduate student Tom Babinec, research scholar Birgit Hausmann, graduate student Yinan Zhang, and postdoctoral student Mughees Khan, all at SEAS; graduate student Jero Maze in the department of physics at Harvard; and faculty member Phil R. Hemmer at Texas A&M University.